Position : Tips - How to recover deleted files from USB drive (free)? How to recover deleted files from USB drive (free)? Want to recover permanently deleted files from USB drive? This tutorial introduces methods to help you get deleted files back from USB flash drive step by step. Read the details to learn how to undelete files from USB right now. "I have a 32GB USB Kingston USB flash drive which stores many photos and documents. A couple of days ago, I removed some useless file to get more space. However, I found out some deleted files are still useful to me. I'm wondering if there is a way to undelete those files from USB drive. Thanks, I'd greatly appreciate the help!" USB stands for Universal Serial Bus and it is an integral part of this digital world, for example, it is used extensively to connect computer with external devices like keyboard, mouse, smartphone, external drives and so on. USB flash drive is a widely used, tiny and useful storage device, and we use it in various ways in daily lives. USB drives are important devices in data storage, management, transferring, etc. and bring about great convenience. It is very portable and small in size, thus users can carry it anywhere they go. Also, USB drive is able to provide large storage capacity, and users can store large amount of data on it for backup or data transfer. However, USB drive also causes problems like data loss issue. It is common wisdom that data loss issue is not avoidable, for various factors can lead to the issue. Files such as photos, videos, music, office document, application, emails and so on can get lost. Fortunately, USB data recovery is available and can be done via a couple of methods. If you are reading this article, you've probably lost some important data on USB disk and want to get them back. You can keep reading to dig it out. To figure out why you can recover deleted files from USB flash drive, you should understand the storage principle on USB disk first. Once the USB drive is connected to computer, you are able to write or read data on it. When a file is written on USB drive, operating system will check the File Allocation Table to find space and then store file content to corresponding sectors on the USB drive and record its location in File Allocation Table. Thus the file you stored on the USB drive is stored on two parts, i.e. file information stored on File Allocation Table and file content stored on corresponding sectors. If the file gets deleted, operating system deleted file records in File Allocation Table without wiping sectors which store file content. Since File Allocation Table deletes file information, operating system no longer knows where file content is stored and regards the file is deleted. Thus, disk sectors are marked as Free and new files can be stored. Till now, the actual content of the deleted file still stays on the USB drive and it can be recovered. However, if system stores new data on that area and occupies those sectors, the deleted file will be overwritten and cannot be recovered. USB data recovery tool is able to scan all disk sectors and analyzing data to recover deleted files SD card, USB drive or hard disk. Successful USB drive recovery is decided on a couple of factors, and you should take precautions when you realize data loss issue occurs. Here are some notes you should keep in mind in order to get successfully data recovery. Stop using the device immediately to prevent further damage to lost data. For instance, do not save any new files to the drive or access any existing files on the USB disk. That's because those actions can overwrite deleted data and make them unrecoverable. Do not format or reformat the USB drive, as formatting process does involve writing actions. Do not create new files, move data, copy data or anything else on the USB drive. Close all other programs which might be using the USB drive. Do not try to repair bad sectors for the drive, although it contains bad sectors, for the repairing process destroys data stored on or near bad sectors. If the USB drive is physically damaged, you should contact professional data recovery center which own recovery machines to retrieve data from damaged disks. Carry out USB data recovery as soon as possible. 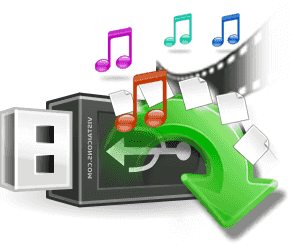 You can use either free or paid USB data recovery software to get back delete files. The following part will present a couple of methods to help you get back deleted or lost data from USB drive, SD card, local hard drive, external hard disk and so on, and you can try these solutions one by one. This method uses Command Prompt to recover deleted files from USB disk instead of any data recovery software. Command Prompt is a free tool built-in Windows system and it supports various commands to complete required operations. Please note that not all deleted files can be recovered in this way, and you should try other solutions if this one does not work on your issue. Step 1 Connect the USB drive where deleted files were stored to your computer and make sure it can be recognized by Windows. Step 2 Launch Command Prompt. Click Start button and type cmd in searching box; then right click cmd.exe and select Run as administrator. Note: H is the drive letter of the USB drive and you should replace it with the USB drive on your computer. Step 4 Wait for the process to complete and close the window. Then you can check if your files are recovered. Previous versions of files or folders are created by Windows backup feature and you can use them to restore files or folders which have been deleted, damaged or modified. If you've never created a backup for your files or folders, you cannot restore deleted files via this method. Step 1 Open Windows Explorer by clicking Start button and selecting Computer. Step 2 Locate the folder which contains your deleted data. If you do not remember the exact name or location of the folder, you can search for it using the search box. Step 3 Right-click on folder and select Properties. Then click on the tab "Previous Versions". Step 4 Now you can see a list of previous version of the folder. Select the file edition you want to restore and click "Restore" button. Supports recovery of lost data from hard disk, Recycle Bin, external hard drive, memory card, flash drive, SSD, USB drive, etc. Supports to recover lost data due to deletion, formatting, RAW drive, partition corruption, virus attack, system crash, partition deletion, disk repartition, etc. 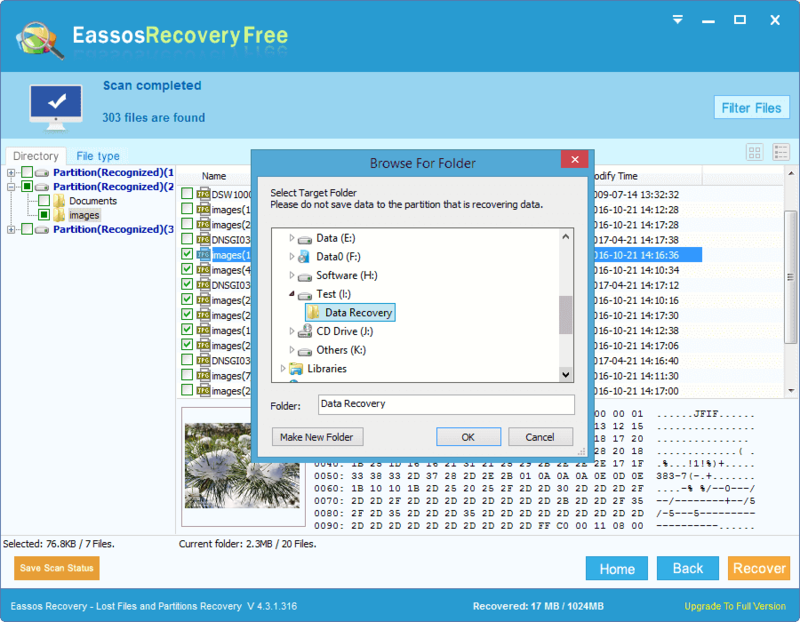 Recovers files from all kinds of file system such as FAT32, exFAT, NTFS, FAT26, etc. 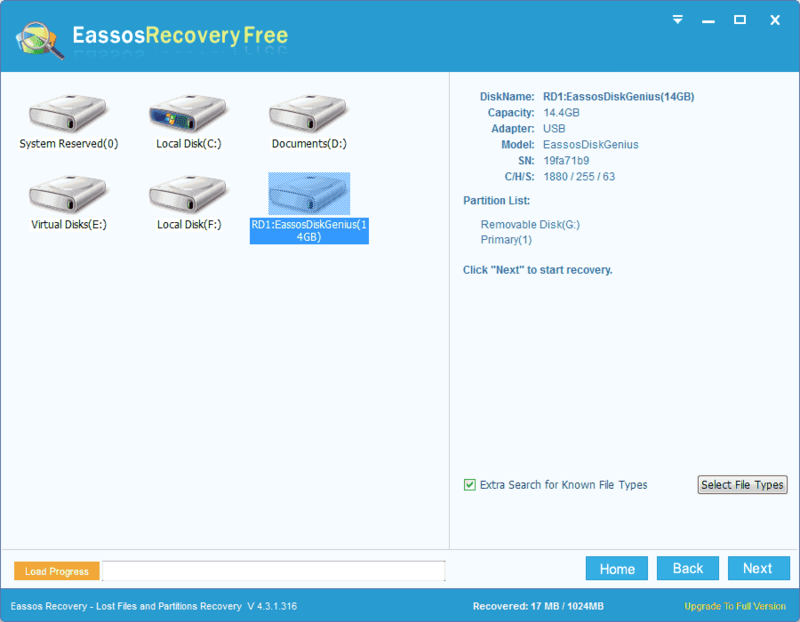 Insert the USB drive into the port of your computer, and download and install Eassos Recovery Free edition, then you can get started as following steps. Note: do NOT install the software to the USB drive, or lost files will be overwritten. Step 1 Launch the USB recovery tool and select Recover Deleted Files recovery option from the main interface. 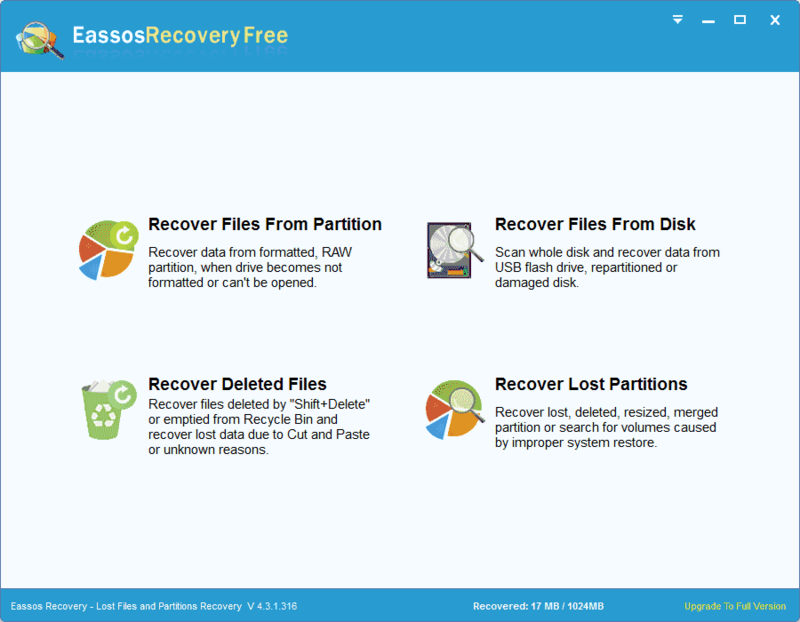 Recover Deleted Files: this option is designed to recover files deleted by Shift+Delete, emptied from Recycle Bin, recover lost data due to Cut and Paste, or recover deleted files from memory cards , USB drive, portable HDD, etc. Step 2 Select the USB drive from which you want to recover data, and click Next button to scan the drive to deleted or lost files. Step 3 Preview and recover deleted files from USB disk. After scanning completes, you can preview files listed in the scanning result and find out those you need. Click a file and you can preview the thumbnail and hex data, and double-click a file and you can view its content in original size. Select files you want to restore and click Recover button, and you can set a folder to save recovered data. If you back up data on a regular basis, for example, create a copy for important data and keep backups on computer or other hard drive, or create partition image regularly. Then you can probably find out lost files in backup files. If you do not keep a backup, then you should consider starting backing up data immediately. Check online or cloud storage service you use. It is possible you've uploaded your files to a cloud storage service such as Microsoft OneDrive, Dropbox or Google Drive. Step 1 Launch Eassos PartitionGuru Pro from your computer and you can see the USB drive from the main interface. Select the USB drive and click "File Recovery" button. 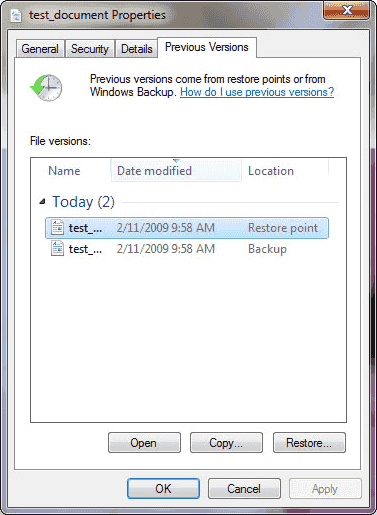 Step 2 Select "Recover Deleted Files" option and click Start button to scan selected USB disk. Note: you can select "Complete Recovery" and "Search For Known File Types" at the same time in order to find out as many files as possible. Step 3 Preview files to check if files are correct and decide if it is the one you want to recover. File preview is available during or after scanning complete, you can double-click a file to preview file in its original size. Files that can be previewed successfully can be recovered correctly. Step 4 Choose lost files you want to recover and right-click them to select "Copy To". Then, you'll proceed to save selected files on a different drive a safer location. The process of recovering lost files from USB drive is no longer complicated or time-consuming, and anyone can easily get back lost data easily with the help of recovery software. Although USB recovery becomes an easy task, we still recommend you back up files on a regular basis. Hope this tutorial helps you recover deleted data from USB drive. If you have any questions or need further help, please feel free to leave a comment or contact our support team.